The methodology to follow either trading or investing totally depends on identity and the behaviour of stock market participants. It may happen sometimes a participant is referred to as a stock investor and the next day some guy becomes a trader. Whatsoever may be one’s approach either trading or investing it may be profitable with skill, dedication, and discipline. Trading or Investing. Which one is better? It totally depends on your motives in financial goal, passion, objectives, knowledge, strategy, implementation, experience, time devotion, capital to some extent and personal obligations. People think that trading and investing is same but it is different in various aspects just like Warren Buffett and George Soros, made a great fortune in two different paths through their objectives were same. Warren Buffett who made his money from long-term investments says, “I will tell you how to become rich. Close the doors. Be fearful when others are greedy. Be greedy when others are fearful”. George Soros who made his money from a countless number of trades says, “Markets are constantly in a state of uncertainty and flux and money is made by discounting the obvious and betting on the unexpected”. Trading vs Investing: Which suits your personality? Identifying the personality at the very beginning will enable you to focus on the right tools and technicals. Stock investors rely on fundamental analysis for identity investment avenues and think about risk till they bear. While stock traders use technical analysis to get maximize returns. They focus on historical and current events and think about profit and loss for the same day. Stock investors follow buy and hold strategy to achieve through a single transaction while stock traders hold to buy and sell strategy to achieve through multiple transactions. Also, stock investors hold a stock for a tenure of more than 5 years sometimes a decade while stock traders relatively hold for the shorter span of hard for the same day or 2 days for a quick succession. Stock investors survive the downtrend with an expectation that the prices will recoil and losses will be recovered. Stock traders show protective behaviour on stop-loss orders to ensure that they close out losing positions at predecided prices. Stock investors usually focused on management forecasts and P/E Ratios their return 10-15% annually While stock traders work on moving averages and oscillators and their average return is 10% per months. 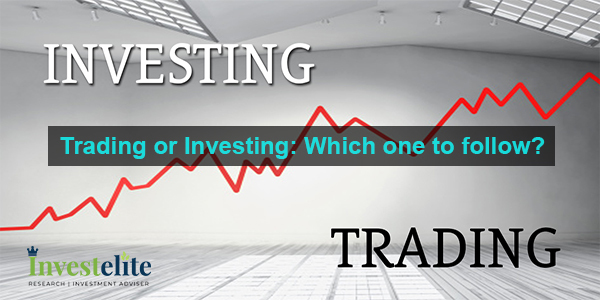 Trading VS Investing: What we suggest? Our investment advisory firm Investelite Research suggests you the best way to team up and to use as a base study then implement any of the above two strategies with intensity. Our company has system backed by data and we believe that trading without data is trading blind and same as investing without fundamentals is investing blindly. Know the algorithms that work to beat the market. Learn all the tactics and fundamentals of companies situations like balance sheets, assets, liabilities performance etc. If your technicals in theoretical and practicals are good then better to follow trading principles. You can take professional advice from our certified experts of Investelite Research to mark your effective presence in Intraday. If you want to go for stock investments than build strong fundamentals.